In a skinny-no-whip-mocha-latte world, The Tea Drinker's Handbook is a refreshing return to America's roots in tea-drinking. Though tea is one of the most-consumed beverages in the world, second only to water, it is far from mundane. A Top of the Class Chamomile Tea! Summary : This is, by far, the best chamomile tea I've ever had. The blend of chamomile and mint is absolutely superb. If you like chamomile teas with mind, head on over to the Dragonwater Tea Company (now out of business) and get this tea right now...before I buy out their inventory! Review : Well, so much for my sleep schedule. Depite earlier talk about it, I've yet to get off this strange go to bed at 6am and wake up at 2pm schedule. But still, I want to TRY, but need to get a few hours of sleep to do so. And thus, wanting to desperately return to normal, human hours, I dug out a chamomile tea from the Dragonwater Tea Company (now out of business)which has the appealing name of Chamomile Mint. 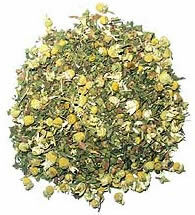 Here is how the Dragonwater Tea Company (now out of business) descibes this tea : "Chamomile Mint Tea. Artisan blend of the highest quality Egyptian Chamomile blended with peppermint leaves. ."
As you can tell from the ingredients, this tea contains chamomile flowers and peppermint leaves...and nothing else. Umm. How to begin this. Oh, I know, the fragrance of this tea is beyond anything I've experienced with a chamomile tea before. Even BEFORE I had ripped open the foil package I could smell this tea. The peppermint aroma is just wonderful...and very strong! Needless to say, with such a wonderful aroma, my hopes leaped sky high that I would have a good tea tasting experience. And while I seem to like most chamomile teas to one degree or another, a handful have been quite unpleasant due to a burnt aroma and burnt taste to them...due to the tea containing crappy, stale and cut-up chamomile flowers. Well, I must say, this tea surprised even me, lofty expectations and all. The very first sip was good, but wow, wait a second and then the peppermint hits you. I love how on the first sip you could taste the pleasant but not strong flavor of chamomile, and then, a few seconds later, the moderate flavor of peppermint invades your taste buds. What a lovely tasting experience it is! I let this tea brew 9 minutes tonight, as I was hoping for a strong flavor. And I was rewarded. Of course, by strong flavor I should say "strong flavor for a chamomile tea." The flavor of the peppermint in this tea by no means compare to the flavor found in a high quality loose-leaf peppermint tea, just to prevent any mixups here. But of course, a chamomile tea isn't supposed to have a jaw dropping flavor. It's supposed to be subtle, without a after-taste that lingers forever. After all, it's a bedtime tea. But still, I've had so many chamomile teas that are simply "boring" and rather "flavorless" that this tea simply sticks out as the best chamomile tea I've ever had. You do get an after-taste. And you'll notice the flavor, that's for sure. But yet, it is still an ideal bedtime tea, as the after-taste only seems to linger for a few minutes. Recommendation : Absolutely. This is the best chamomile tea I've had. The peppermint blends perfectly with high quality chamomile flowers, producing a tea tasting experience that is unique and highly memorable, to say the least. And yes...the chamomile is doing it's duty...I'm fast falling asleep. So goodnight. Brewing Instructions : Use 2 teaspoons of tea leaves. Pour 1 cup (5.5 ounces, but 6 works quite nicely) boiling water over the leaves. Let the tea brew for 5-10 minutes. 9 minutes brewing time was used for this tea review.